Upper Falls Baston Creek Connestee Falls Gated Community Brevard North Carolina From a trip to Brevard, North Carolina with some great friends, we stayed in the Connestee Falls gated community on this trip which had 5 waterfalls on the property. 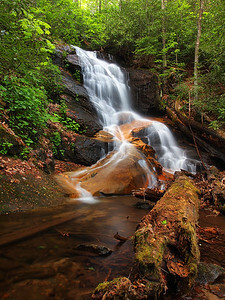 Although we didn't have time to visit all the falls on the property, we did visit a couple, this one being quite possibly my favorite falls I visited on the entire trip. 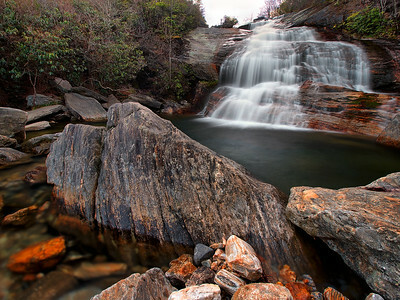 Upper Falls on Bastons Creek is one of the more unique I've seen in North Carolina, all because of the color of the rock. The rich orange tones were beautiful and dangerous as they were super slippery. A couple of us took a tumble or two, but it was well worth it to capture this unique beauty! 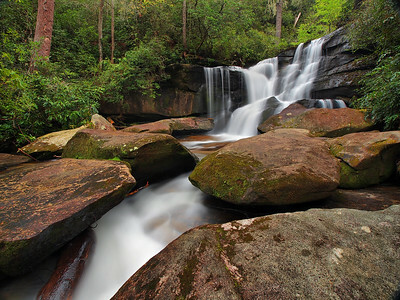 Upper Falls Baston Creek Connestee Falls Gated Community Brevard North Carolina Brevard, North Carolina is one of those places that you can overwhelm yourself with things to do, especially when it comes to visiting waterfalls! 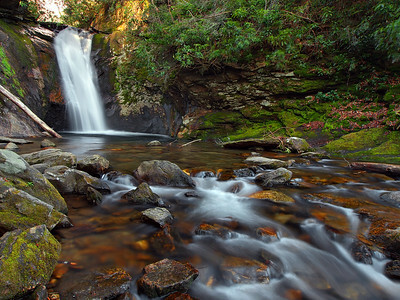 One of the lesser known falls that I got to visit there was the Upper Waterfall on Baston Creek, located in the Connestee Falls gated community. 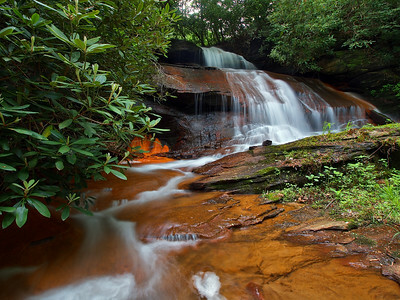 I loved the unique color the rocks around this waterfall, interestingly the rocks were slick as oil! What makes this stream even more fun is the fact there's two more falls further down! 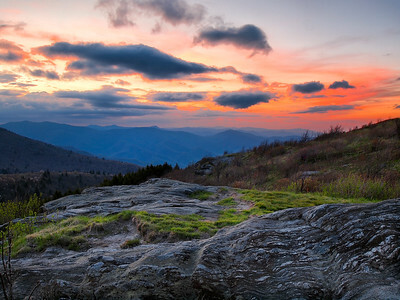 Sunset Black Balsam Knob Sawtooth Wilderness Blue Ridge Parkway I've visited the Blue Ridge Parkway umpteen times over the last several years and one place I've never paid a lick of attention to is Black Balsam Knob. Boy, have I been missing out. At the suggestion of Flickr friend Tim Williams, myself and good friends, Randy Sanger, Karl Hassel, Todd Williams and Jeremy Chapman made the .5 mile 400 ft elevation gain hike up for sunset. Well, some of us did, myself, Randy and Karl chose to stay a little under halfway from the top where there were some cool exposed rocks. Sunset itself was very cool to watch but just didn't have the impact I was expecting. After several minutes it was beginning to look like post sunset was going to be a dud too, but in the final minutes a last blast of light colored the sky and then quickly it was gone. 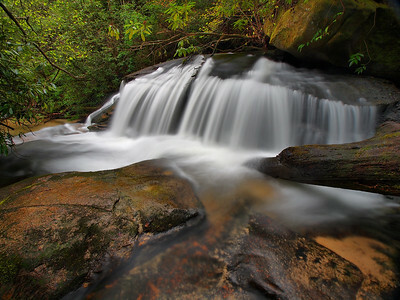 Falls On Cedar Rock Creek Pisgah National Forest North Carolina On of my favorite waterfalls I've visited in North Carolina was the Waterfall On Cedar Rock Creek in Pisgah National Forest. The hike isn't that bad, 0.7 miles and the reward is more than worth it. 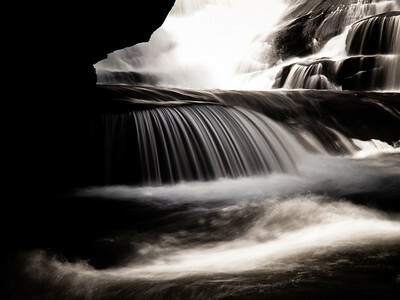 It has so many perspectives you can shoot from and the falls itself is just loaded with personality! 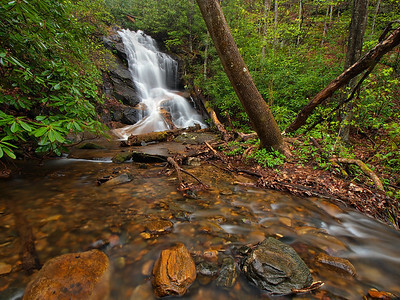 Thanks to Kevin Adams's North Carolina Waterfall Guide we found out there was a falls a short hike upstream from this one and it was well worth the hike, I'll share that one a little bit later. 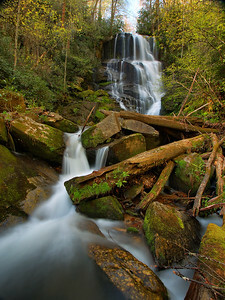 Courthouse Falls Courthouse Creek Pisgah National Forest When we arrived at Courthouse Falls in Pisgah National Forest in North Carolina, hard light was directly in the small gorge. Checking out the level of the sun in the sky we decided to wait out the suns sinking behind the mountain, it ended up taking a bit longer than we anticipated, but in my opinion it was well worth it. 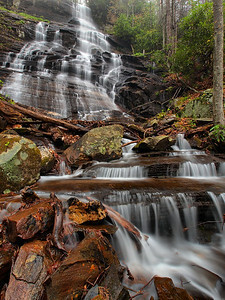 Courthouse falls is a falls of a different sort, as it is a 40 foot chute/cascade, truly a beautiful place and it made it all the more worthwhile to wait out the light with some very good friends. 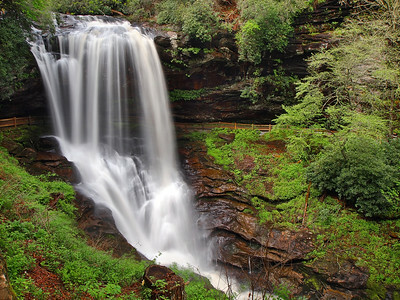 Dry Falls Cullasaja River Nantahala National Forest Highlands, North Carolina If you truly want to experience the power of water, Dry Falls on the Cullasaja River is truly the place to do it. 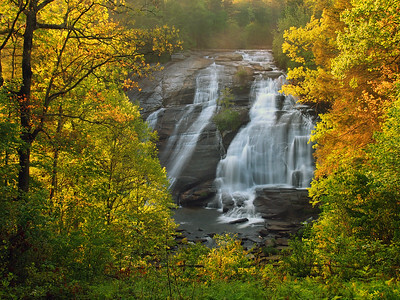 Located about 3 miles west of Highlands, North Carolina along US 64, the falls is easily accessed from a large parking lot and a short but all downhill paved trail that not only gives one awesome views of this 70 ft tall high volumed beauty but you can walk behind it too! This is one of the few cases that I don't mind a natural place that has been humanized. If it wasn't for the railing I'm sure no one would be allowed to experience what it feels like to stand behind a wall of water crashing down before your very eyes or for that matter, body. If you stop by for a visit, be prepared for lots of people, but even more so, be prepared for awesome. High Falls Little River DuPont State Forest One of the falls I wanted to knock off my list to visit in the Brevard area was High Falls. 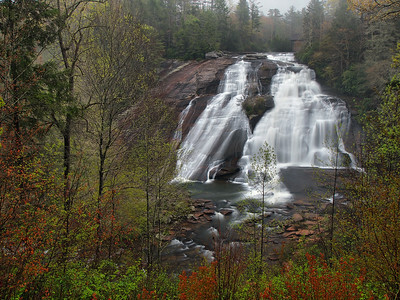 Located in DuPont State Forest this enormous 100 + ft. tall cascade is on the Little River, I had been near this falls twice when I had visited the falls downstream but the first time I didn't know it was there and the second hard light discouraged the trek. 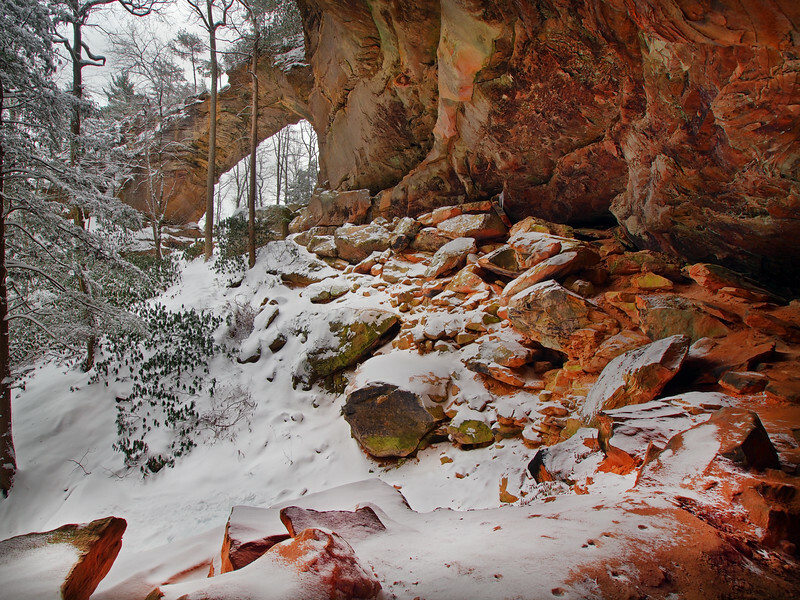 I almost didn't make it this time as a steady all day rain had put a damper on our day and it was nearing dark but after some coaxing of my good friend Jeff Burcher he decided he would go and we'd take the easy hike and not visit the base. Man, was it worth it, and thanks for driving Jeff! High Falls Little River DuPont State Forest North Carolina When myself and good friends Jeremy Chapman, Karl Hassel, and John Deas arrived at the High Falls parking lot in North Carolina's DuPont State Forest I was hoping the sun had not elevated too far into the sky. As we made our approach on the trail the more concerned I got, not only because of the position of the sun but also because there wasn't a cloud to be seen. Well, when we got there I was both sad and happy. I was sad because I knew photographs from the base of the falls was completely out of the question, however the morning light was absolutely stunning as it backlit the trees in a beautiful golden glow. Would you believe this was taken in spring? The first time I visited this falls was a couple years ago when my good friend Jeff Burcher and I decided to head out in the rain from our nearby rental since I'd never seen it before and I was determined to finally get a photograph of it. We only shot it from this perspective and I got couple great shots that I liked, and unfortunately on this trip it was again the only perspective I got of the falls. I'm really looking forward to a return visit on a gloomy day, because I want to spend some quality time with this towering 100 ft tall beauty, and I'm sure it will take another twenty trips knowing my luck with the weather and North Carolina waterfalls, but I'll get it. 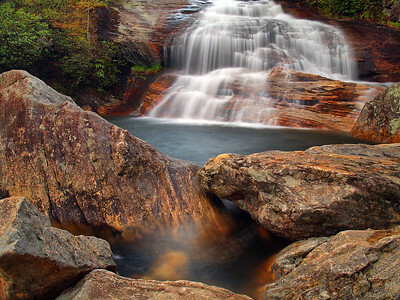 Lowest Tier Triple Falls Little River DuPont State Forest Brevard, North Carolina One of my favorite North Carolina Waterfall shots I've taken is this isolation of the massive Triple Falls in Dupont State Forest near Brevard, North Carolina. Difficult lighting and an over abundance of people forced me to concentrate on the base of the lowest tier. It was a total accident when I processed it into this two tone monochrome. Lowest Tier Triple Falls Little River DuPont State Forest Brevard, North Carolina Triple Falls in North Carolina's DuPont State Forest is one of those falls that when you first lay eyes on the whole thing you are simply awestruck. Standing at the overlook on the Triple Falls Trail you see the river tumble 180 ft over 3 distinct drops, it gives you the impression it's twice as large as it really is. Once you make your way down to the falls and you visit each tier you realize it's not as big as you thought, but it's still impressive. Of the three tiers my favorite is the lower, it has the greatest personality and offers numerous isolation opportunities. This is the the foot of the approximately 60 ft. tall tier, which also happens to be my favorite section to shoot. I love how the water races in from the right then doglegs over a small ledge creating this beautiful uniform flow. On a cloudy day you could spend hours here, heck on a sunny day we spent a couple at this spot before the sun finally ran us off. 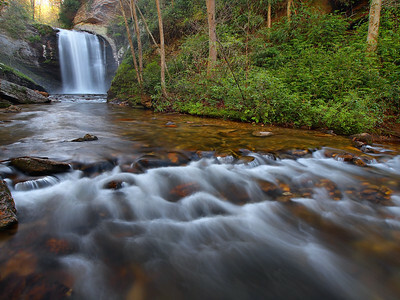 Eastatoe Falls Shoal Creek Private Property Pisgah National Forest Rosman North Carolina Another of North Carolina's gems is Eastatoe Falls, a privately owned waterfall. This towering beauty was a complete surprise to me as I thought it was half the size it is but depth of field can play tricks on the eyes. 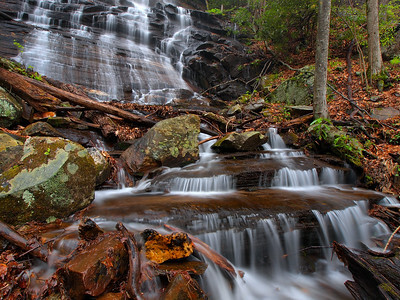 At 70 ft. tall, the falls has many perspectives to view, here I decided to include a cascade downstream giving the impression it is just one long falls, there's at least a 20 foot separation between the base of the falls and this cascade in the foreground. Sunset Graveyard Fields Milepost 418 Blue Ridge Parkway North Carolina Have you ever been like, "Oh yeah, we're going to have a flipping awesome sunset tonight" and it completely goes awry and you get absolutely nothing when the real show is about to start? 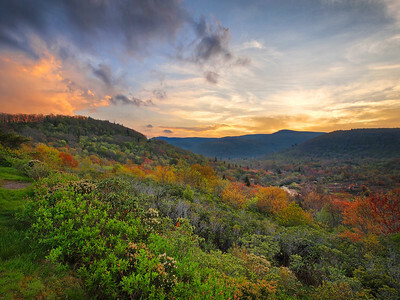 Well, it happens more often than not to me, and in this case when we set up to shoot sunset a couple weeks ago from the Graveyard Fields parking lot along the Blue Ridge Parkway in North Carolina we got gypped, sorta. After shooting the 2nd Falls on Yellowstone Creek we made our way back up to the parking lot, it was storming over the mountain across the Blue Ridge Parkway but over the fields it looked quite apparent that we were in store for a show and we set up along the southwest end of the lot. At first there was some color and I took a few shots, but do you see those black clouds in the upper left hand corner of the photograph? Well, you wouldn't believe it, but they moved in from the south, quite quickly I might add, completely obscuring the colorful scene beginning to happen. Although this was pretty frustrating I was hoping that some of the pre-black cloud invasion shots turned out good. Although it wasn't what I was looking for, I did get something I liked. 2nd Falls Yellowstone Creek Graveyard Fields Blue Ridge Parkway Milepost 418 North Carolina If you're ever on the Blue Ridge Parkway and pass by The Graveyard Fields in North Carolina, I highly suggest stopping by and making the 0.3 mile moderate hike to view 2nd Falls on Yellowstone Creek. 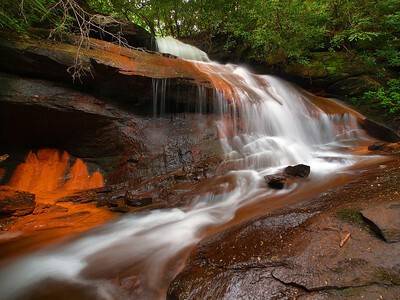 Although I think this is one of the most difficult falls I've ever tried to shoot, it is gorgeous and no matter what time of day or kind of light you visit the color of the rocks alone make this a must see. 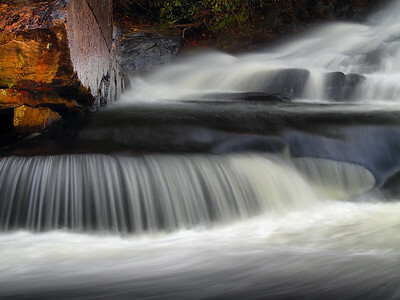 From a photographers standpoint what makes this falls so difficult to shoot is the wide open canopy, to shoot the entire falls you can't make a good frame without including the sky above which usually will be blown out. This will be my last visit to the falls until the opportunity arises for a moody cloudy sky above, because even with HDR, the tonal changes are too strong to get an even composition on a cloudless/mixed sky. Here, I cropped the top off a little and tried something a little new with the falls. You just can't beat those colorful tones that's for sure. 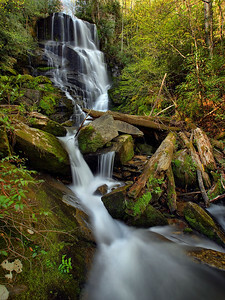 Waterfall On Log Hollow Branch Log Hollow Branch Blue Ridge Mountains Pisgah National Forest North Carolina One of the things that I hate when waterfalling is rain, it gets on the lens, can ruin your camera and it's hard to hold an umbrella and fool with a camera on a tripod. 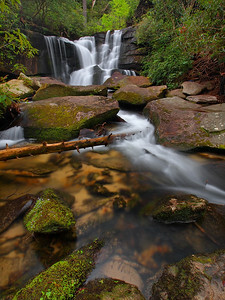 Here at the Waterfall On Log Hollow Branch in Pisgah National Forest my good friend Randy Sanger held the umbrella for me, but unfortunately water still got on the lens for a few shots. A little editing removed the drops but another drawback is I feel rushed and then don't take very many perspectives. 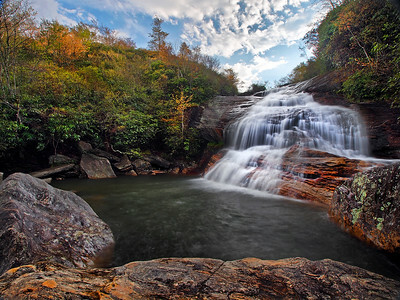 Nonetheless I am grateful I had the opportunity to visit this beauty with so much water on it and with some great friends, and it was one of my favorites of out trip to North Carolina!